Food robotics company Chowbotics announces that its first product, a salad-making robot called Sally, recently passed the UL and NSF-25 safety and sanitation standards. To obtain these certifications, Sally the Salad Robot underwent and passed an evaluation at Underwriters Laboratories (UL) to ensure it and the facility where it is produced meet specific standards for food safety. The certification indicates that Sally meets health and safety standards for use in commercial establishments. Offices, convenience stores, hotels, airports as well as fast casual restaurants are places that can use Sally to bring fresh, healthy and delicious food to consumers. These certifications open the door for a comprehensive roll-out of Sally at these target locations. Sally offers over 1,000 custom salad options. Salads are created in less than a minute and a half with any combination of up to 22 ingredients, and users can fine tune the calorie total by adding or subtracting ingredients via touchscreen. 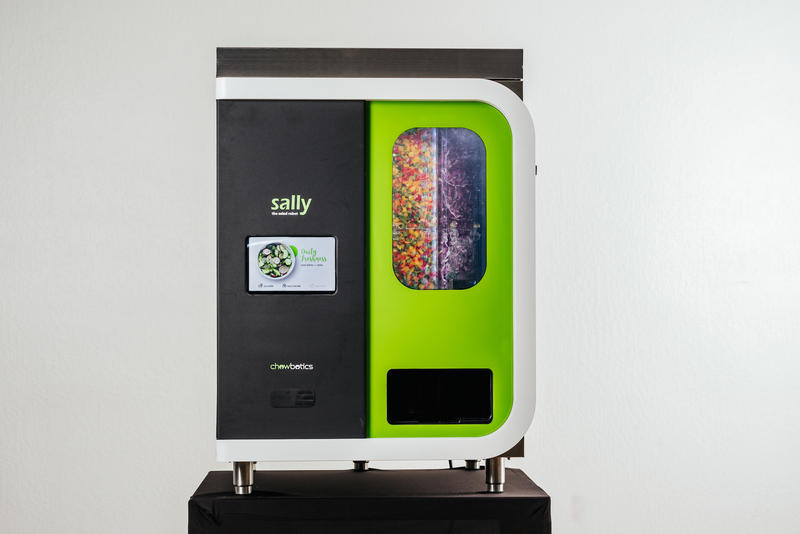 Like a vending machine, Sally doesn’t require staffing; it can whip up salads around the clock, making it ideal for employers who want to provide options for when the cafeteria is closed, hotel operators who want to give guests an array of a healthy choices beyond the minibar and convenience store operators wanting to provide a quick, fresh meal for commuters on the go. Sally’s proprietary technology reduces the risk of foodborne illness, as ingredients are kept refrigerated, sanitary and separate. Each of Sally’s ingredients is replenished on a regular basis and contained within the robot, greatly reducing the potential for contamination. Sally is an ideal alternative to a salad bar, especially in higher-risk facilities such as schools, retirement homes and hospitals. About Chowbotics: Chowbotics develops robots for food service. By automating repetitive tasks, Chowbotics aims to increase productivity and enable creativity, both in and out of the kitchen. The company’s first product, Sally the Salad Robot, allows users to create custom salads. Proprietary technology ensures precise caloric counts and protects the integrity of ingredients, keeping them fresh, sanitary, and separate. Future robots will offer breakfast as well as Mexican and other ethnic foods. These robots could be used in cafeterias, restaurants, hotels and other commercial venues. Chowbotics, was founded by Deepak Sekar, Ph.D., an inventor with more than 100 patents. He serves as the CEO. Rich Page, an Apple Fellow who joined Steve Jobs as Co-Founder and VP at NeXT, is Executive Chairman. Investors include Techstars Ventures and Foundry Group.